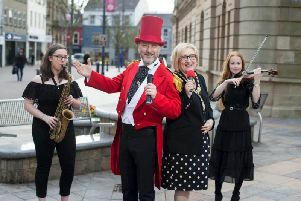 As a music professor in Derry and an expert on jazz in particular, Frank Lyons is perhaps the person best judged to weigh up how successful the City of Derry Jazz and Big Band Festival has become. And part of that success has been the participation of a growing troupe of graduates and world-renowned musicians who themselves honed their skills while studying at Magee. Ulster University was the first place in Ireland where jazz was taught as a specialism as part of the undergraduate and PhD Music courses. Interest in the courses has soared since the move from Jordanstown to Magee back in 2004- just as the Derry Jazz Festival was finding its feet. As Jamie Cullum brought down the curtain on the 14th festival last night, Professor Lyons said: “We moved the course here and we have always had a lot of interest from jazz musicians and it has just grown and grown and grown. “We have had a lot of big names through the door doing PhD and they have gone out into the big bad world and made a contribution to the creative industries. Among the musicians who have come through the Magee undergraduate and PhD courses are Paul McIntyre, David Lyttle, who now runs one of the most successful recording labels in Europe and Linley Hamilton, an internationally-renowned trumpeter and BBC broadcaster. Another young girl making waves is drummer Rebecca Montgomery, while Mark McKnight has been making his presence felt in New York. And Mr Lyons said the eclectic nature of the Derry Jazz Fest meant that it wasn’t just Magee’s jazz experts who were being given a platform. “Some of our students play rock fusion, blues trad, and it all adds to that general buzz that the city has over the weekend. “The course success has been very, very broad. There’s a jazz, blues and rock element to it and still a very strong Irish traditional element and we can always contribute, and always do, to different festivals and events locally. “Even in terms of student numbers we are taking double what we used to do these days, with 65 to 70 undergraduates in Music. “We were the first university to have graduates in Jazz at PhD level, and we are still by far the biggest generator- nowhere else produces so many. “It really does give you a very unique brand. Higher education is such a competitive field and if you have something you can sell that is very unique it sets you apart from the competition. Alongside the local talent, Prof. Lyons said the Jazz Festival has attracted many of the world’s biggest names on the jazz scene. “We have this ideal combination,” he said. “You get the real world class talent like Jamie Cullum, Brian Priestly, really important world stars, and then you have the younger generation. He added that the organisers “got in at the right time and captured the imagination and it gets great support from the people of the city”. Professor Frank Lyons, Ulster University.